You've seen car mounts for dashboards, windshields, and air vents... but have you seen one for cup holders? Well, now you have. 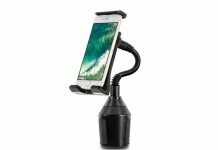 Meet the U-Grip Cup Holder Car Mount. This flexible unit works for phones and tablets and lets you keep the apps you need within sight without actually using your hands.